We are both currently pursuing our bachelor’s degrees. Adam is going for criminal justice, and hopes to become a police officer, while Sara is working toward her degree in elementary education. She eventually plans to get her master’s degree in special education. 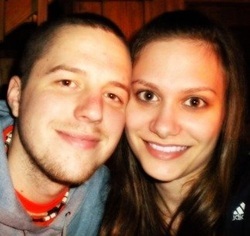 We will both graduate school in December 2012. Adam loves sports, and plays on a soccer team. Sara used to dance, and would love to get back into it when she is finished school. She also loves to read anything and everything. In our free time.. well we don’t have a lot of free time between work and school, but we like to watch television and just relax when we get the chance. Right now we like to watch True Blood, Dexter, Game of Thrones, Ugly Americans, Archer, and whatever else is on. 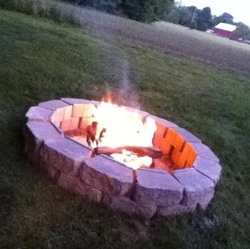 Our favorite thing to do is sit out by the fire pit that Adam built in the backyard. I met Adam in May 2008, shortly before graduating high school. We were both cashiers at the same store, and there was definitely some strong chemistry between us. I was afraid to make the first move because he was a little older, and I never thought someone as cute as he was would be interested in me. One night I was browsing through facebook while talking to my best friend. I got a friend request, but did not recognize the name of the person, since I did not know Adam's last name at the time. I looked at the picture a little more closely, and realized who it was. "BREANNA THAT CUTIE FROM WORK JUST ADDED ME!" Shortly after he sent me an email asking me to go to a baseball game with him. I was so nervous the whole time, but I realized that this guy was just fun to be around. I really enjoyed his company. On the way home, I got a feeling like I was going to be spending A LOT of time with him. We became official a few days later. February 19, 2010, I came home from spending the day with my friend Jessie, and getting our hair done. I had taken a risk (for me) and gotten bangs, and was so mad because Adam didn't seem to notice them. He just kept saying "Come upstairs, come upstairs!" so upstairs I went.. There was a flower arrangement on the table in our bedroom, and I was suprised because Adam is not the type to just buy flowers for no reason. He told me that if I looked inside them, I would find another gift. "You aren't seriously going to make me look inside there are you?!" I asked. 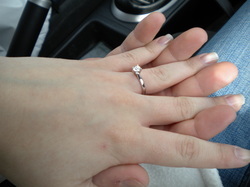 We had picked out the ring together the week before, so I knew what was going on by this point. I think I was nervous. He laughed and pulled the ring out of his pocket and then asked me to marry him.